Pallet Flow Racks - Ideal for FIFO Inventory Management. We have them! Providing Pallet Flow Rack systems which are gravity-driven and provide easy accessibility setting up products in a position that makes it easy for them to be picked by an operator. 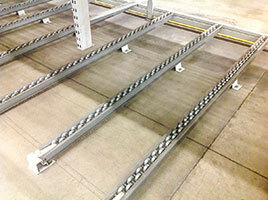 Pallet Flow Racks allow for pallets to be loaded from one side and picked from the other side. As each load is picked, the pallet loads behind move forward into picking position. Pallet Flow Rack systems are perfectly designed for fast-moving product for the FIFO (First-In/First-Out) product rotation. Ideal for quick moving products such as FIFO first-in/first-out. Pallets move towards the far end. Making picking more accessible. No limit to the size or storage density of a pallet flow system. Pallet Flow Racks send pallets through standard pallet racks or to Carton Flow Systems that result in multi-level pick modules that split loads into piece parts or boxes. Warehouse utilization can be maximized with Pallet Flow Rack systems and the lanes are easily made by moving the track into the bay that fits securely in the step of the beam. A metal or nylon stop at the end keeps the pallet sturdy in the bay. This kind of system is idealistic for date-sensitive inventory. There is no limitation on the size of storage density or pallet flow projects. 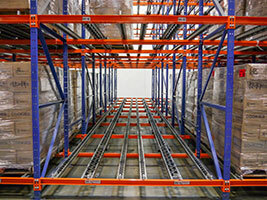 Deep Pallet Flow Racks can be structured to as many as twenty pallets deep with the use of speed-braking systems. 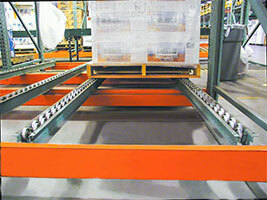 Braking systems allow for control of the flow speed when pallets are removed. Pallet Flow Rack systems provide high-density storage solutions and are for full pallet picking. 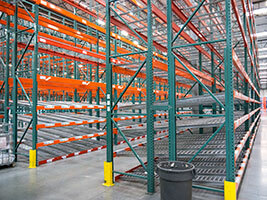 Pallet Flow Racks require minimal aisles because the pallet loads are stored back to back in the rack. Pallet Flow may be combined with Carton Flow or pallet racks that creates a system where full pallets move forward to a picking position and feed other systems to break down the pallets into cartons or pieces. The full advantage of using Pallet Flow Systems is that it makes the most use out of vertical space. In a warehouse, it can be used for multi-level Pick Module installations.